"Good Overall Advice Sabotaged by Over Simplified 'Risky' Suggestions"
Good to average advice overall. Some dangerous overly simplified advice puts the value of the rest of advice into question. Check the ranking of get your ex back advice for better options. To give you the best chance of getting your ex back we also suggest you learn the basics of being attractive with a beginner's manual (e.g. Double your dating ebook). 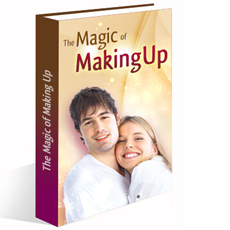 The Magic of Making Up is probably the most popular book (judging by google search references) giving advice on how to recover from a break up and get your ex back after she has dumped you or you have split up. And there are many - see our Getting Ex Back ranking for the complete list. There are a lot of good things about this product. It's well structured with a clear step by step process to follow that is well thought out. A lot of the content is based on sound psychological principles that are relevant and work. The best thing about this product was its simplicity and how friendly it is for first readers of dating advice or anything psychology and relationship related. The vast majority of men pick up their first relationship or dating book when a girlfriend they like breaks up with them. So the content is well calibrated to the audience from that respect - anyone can pick up this book and use it with ease thanks to it spelling everything out in simple and 'down to earth' terms. An example of how this benefits you is that you get told at each stage of the book what not to do with lots of examples. This is great, because it doesn't leave any guesswork for a newbie reader. He often lists things you should not do which will help you to avoid making the biggest mistakes. The book is written for both men and women. This weakens the advice because it is often generalized for both sexes where it shouldn't be. Men and women are different and behave differently in relationships and if you look at the market of dating advice products you'll see that for the most part there is a clear split between coaches and instructors that help women and those that help men - this didn't happen by accident, it's because the advice needs to fit the gender. By writing for both sexes the author is trying to please both sides (and not offend either) rather than just writing something focused that will help the person with exactly their needs and challenges. 1. Situations were brought up that were just not realistic or likely for 'men' but there was no clear explanation that these were in fact 'situations more relevant to women.' I know a lot about dating and advice so it was clear to me - me fear is that it wouldn't be for the men reading this book. 2. The book is too 'soft spoken' and nicey in the slant of its advice for men. Not something I would consider to be helpful to a guy who has just broken up with his girlfriend more likely than not because he has been acting too weak (it's the #1 reason for women dumping men). Note: We are of course reviewing this purely for its usefulness to a man who has broken up with his ex girlfriend and wants to get her back. I'm all for simplification whenever it's possible, but there are some things you can't cut corners on because it leads to mistakes. This is the achilles heel of this product. The information and advice on two sections of the process in particular, understanding why the break up took place and how to get back with your ex, make this mistake. The part on understanding why you've broken up provides some misleading ideas that simplify it all down to one reason (that the author says is different for a man and a woman). Since he doesn't advise you to act on that information (it's just for your own psychology) this isn't that a big deal. I can let it pass. The larger issue is where T.W. Jackson advises you to use some tactics to help you get back with your ex. Two examples are the technique named the instant reconnect technique and another is the handwritten letter. There are many situations where these techniques would come off as weird or could further reduce your ex-girlfriend's attraction to you. I would strongly recommend you use neither of them (if you get the book) because the odds are that they'll backfire. The techniques are often not given with enough information to help you calibrate them to the situation (necessary for success and avoiding a nasty rejection). Part of the reason for this is that the book is short at 62 pages with a large sized font and just isn't large enough to cover the ground it is attempting to cover. The author also wanders into areas out of his expertise such as nutrition and fitness advice (which is dated and not particularly good quality) which takes up valuable space in that 62 pages that could've been used to add more information around actions he proposes you take. The other issue is where he recommends high risk - low return techniques. They have a high risk of causing more damage with no big upside in most cases. The handwritten letter is an example of this - I can see how it would work in some very specific examples, but they are not the most common ones. It's just a really bad idea. The advice in The Magic of Making Up is between good to average. Due to the 'achilles heel' issue of over simplification and the danger of this leading you to sabotage your chances with your ex we recommend you don't get this product. It's a pity, because there is some good useful content on the whole. Check the ranking of get your ex back advice for better options. To give you the best chance of getting your ex back we suggest you learn the basics of being attractive with a beginner's manual (e.g. Double your dating ebook). Attraction always plays a role in a break up, so it will give you the background to understand what went wrong. It's something you can't ignore.